Designed for high flow and highly loaded systems. Utilized at some of the largest recirculating fish production facilities, zoos, and aquariums, Propellor Washed Bead filters accept versatile loads ranging from low to high solids due to the active motorized backwash system. The motorized embedded propeller is used for frequent washing of the media, removing captured solids and excess media biofloc. The sludge then settles to the bottom of the unit where it is drained, reducing water loss that is normally associated with backwash processes. 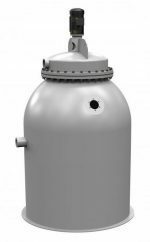 With Propeller Bead filters, you will only lose 10% of the water you that you would normally lose with run-of-the-mill sand filters. AST has both standard flow and high flow (pressurized) Propeller Bead filters. High flow filters can process flow rates of up to 1200 gpm, making them perfect for large systems that need frequent turnover. Suitable for high loads that are typical of aquaculture applications, these filters are capable of handling ammonia loads 50% – 100% higher than standard bead filters. You will be able to lower your overall water and head loss – our innovative backwashing process is gentle enough to protect the biofilm and keep the environment healthy. The Propeller Bead® filter has the most aggressive backwash of any of AST filters. Delivered by a motorized propeller that vigorously mixes the beads, the water enters through the side intake and exits from the top of the filter, trapping solids within the floating media bed. When backwashing, the pump is turned off and the water inlet valve is closed. If the system is pressurized, it must be released before operating the mixing motor. The mixing motor is turned on for 15-45 seconds until the beads fluidize. The mixing motor is shut off and the solids are allowed to settle for ten minutes minimum. Opening the drain early risks losing beads, and the solids will not be drained. The sludge valve is opened, and the concentrated sludge is allowed to gravity drain from the filter. Backwash frequency is dictated by feed rate. After sludge is drained, the sludge valve is closed and the inlet valve reopened. Turning the pump back on puts the filter back into normal operation.